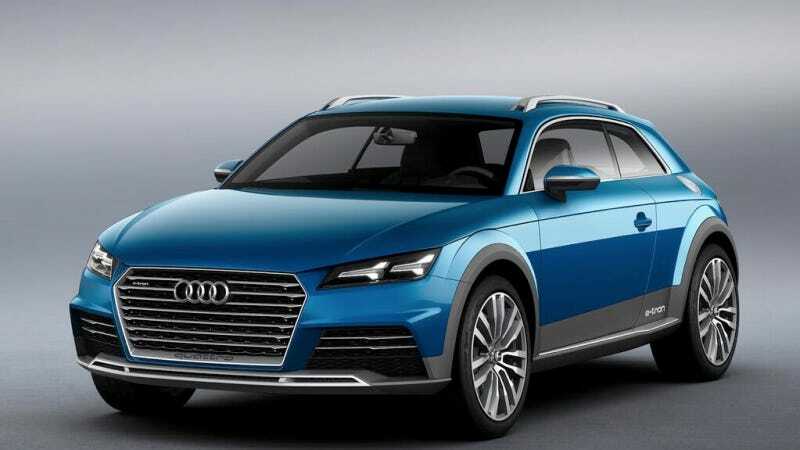 This is the Audi Allroad Shooting Brake Concept, a big name for a little show car that will appear next week at the Detroit Auto Show. But it's a significant debut in that it foreshadows a lot of shapes we're going to see on some small Audi sports cars and crossovers. Audi teased the exterior of the concept last month, but hadn't settled on a name yet. Then earlier this week, they showed the "virtual cockpit" insides of the next TT – which looks a lot like the earlier sketches of this concept. You can see now why this is probably going to tell us a lot about what next year's TT will look like. There's also a good chance it will tell us about what the upcoming Audi Q1 will look like. As a refresh, it's a two-door four-seat crossover-y car with e-tron badges, so it's at least somewhat electric. We'll see the whole concept car on Monday.